As a beginner, sparring does not have to be difficult and with proper protective gear sparring can be fun, enjoyable, but safe. In sparring, students can practice judging distance, aggression, power and learn how to handle themselves under extreme stress (note: there is a difference between scenario play and sparring). Students can also put their techniques and fighting skills to the test to see what works for them and what does not work for them. Remember, no one’s body is the same and everyone is good at something and bad at something. The only way you are going to find out what works for you is by sparring opponents of different sizes, strengths, heights, ages, and specialties. Each class, we generally have 10 – 15 mins of light sparring (roughly 30 % power ). What do we mean by learning distance judging from sparring? In real life conflict is fluid and chaotic. You cannot hit a target if you cannot accurately and quickly acquire a target’s distance: you are wasting energy and exposing yourself to more dangers. 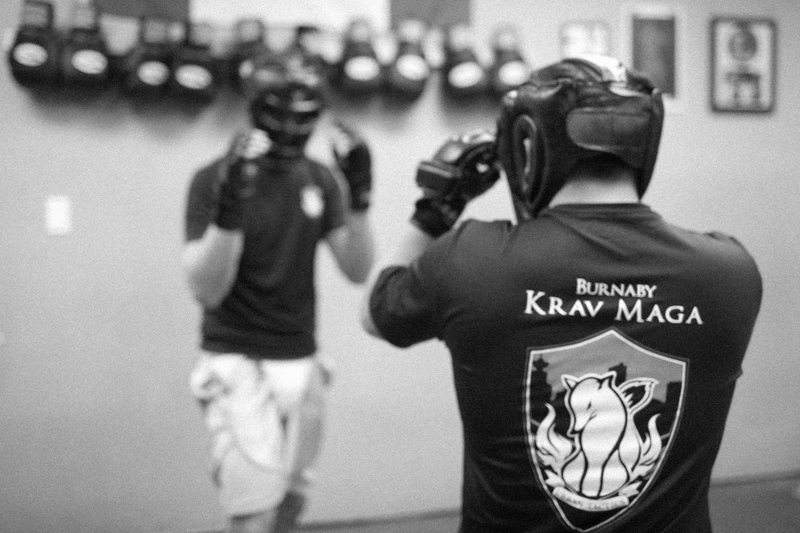 Since Krav Maga is a striking based fighting system (note: most of our defensive attacks are not based on throws or joint manipulation but punches and kicks so it is called striking based) a good distance judging ability is vital. Sparring provides improved training because you get instant feedback right from opponents of different heights and arm lengths which replicate potential opponents that students might face on the street. Aggression is the fuel for all Krav Maga techniques; without aggression any defense or attack moves are futile. A Krav Maga practitioner has to be aggressive and willing to stare into his attacker’s eyes and fight back. 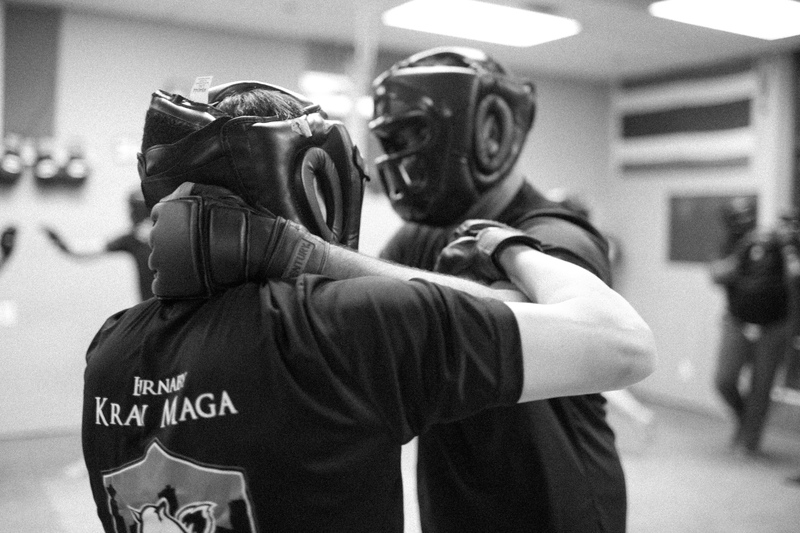 In Krav Maga, there is nothing defensive about any moves. 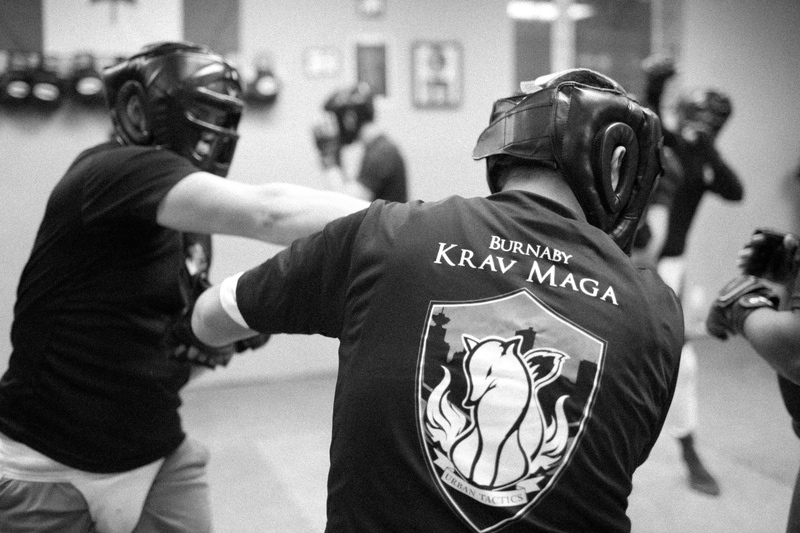 Krav Maga’s moves are designed to inflict maximum damage in order to save one’s life. In other words, a Krav Maga practitioner has to make that conscious decision about willing to hurt somebody in order to save themselves and their loved ones. In sparring, this is where aggression is built, nurtured, trained, and controlled. We each have aggression inside of us, and some people are naturally aggressive but some have to release their aggression which is buried within by law, societal regulation, manners, and culture. At the end of the day there is nothing easier than to find out one’s true nature with the first punch landed on his or her face. Anyone with training can land strong and well aimed shots at a pair of focus mitts or sand bags but few can deliver enough power in the heat of conflict. When there is more than 1 opponent attacking you, Krav Maga practitioners have to get used to multi tasking: dodging, scanning, fleeing, and fighting back all at the same time. Only in sparring one can learn to deliver proper strikes with power as they would in real conflict. Power and aggression usually go hand to hand. When a person is more aggressive, he or she would use more power in his or her attacks (note: this does not mean the attack is effective and strong, the strongest attack is usually delivered when striker is in a relaxed state). It is important that students listen to the instructors’ words of command and only deliver the right amount of power in sparring. Students have to be able to control their aggression. Krav Maga aims to train people to defend themselves, not create psychopaths. It will be a failure if our students end up in jail for excessive self defense. Another good point to control one’s power (energy) is so you do not get overly excited and waste all your energy. A properly delivered attack at a vital area does not have to be strong; a 10 % attack at the groin will stop a grown man. In addition, if you use 100% of your energy on one attacker, how much energy you would have left for the 2nd, 3rd, or 4th attackers? Being in any form of confrontation or physical conflict can be stressful for anyone. The only way to deal with this type of stress is training. Sparring against one opponent or even multiple opponents can be extremely stressful. Anyone can do fantastic techniques when they are have nice weather, birds are singing, green grass under their feet but in real life dangers can occur at anytime, anywhere. You can be soaking wet, tired, miserable or have had too much to drink. Few attackers pick a sunny morning to mug people. In Krav Maga, we train for the worst case scenario. I’m very conscious of keeping my hands up when sparring, but inevitably I’ll still get hit. I was beginning to think that it’s a failure to get hit but then when I think about the Manny Pacquiao fight, even the pros get hit. So my friend and I came to the conclusion that we’re going to get hit and we just have to accept it. It’s still frustrating though….. This is exactly what sparring is trying to teach students. They are bound to get hit even when they did everything perfectly and in real life under extreme stress no one can do everything perfect. Real life is not a kung fu movie. They should have a healthy fear toward getting hit and know that they are not invincible. Their brain and body must still function even when they just got hit or choked. Pain is no stranger to them. They can react to the real world because they are used to surprise and pain. At the same time they realize the power of their own attacks and will not use them unless their lives or their loved ones are in danger. On Day 1 students should start sparring. 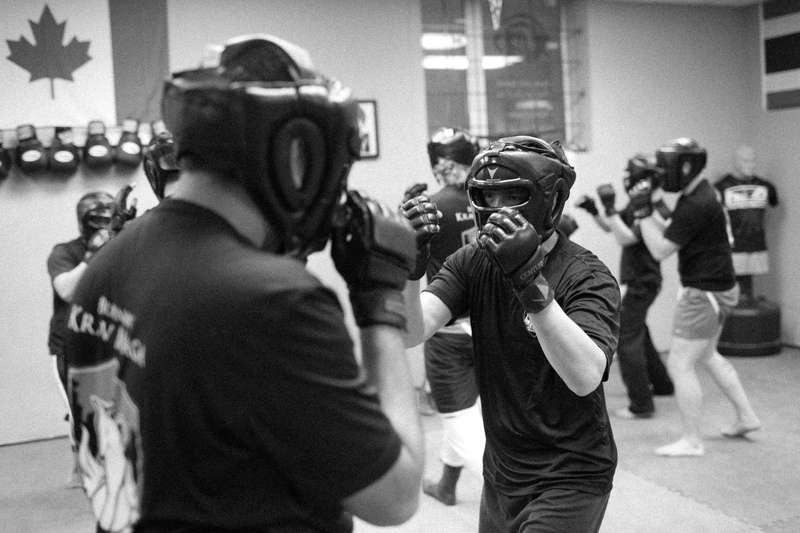 In most martial arts, students do not do sparring until at least 6 months into training but at Urban Tactics Krav Maga, we want our students adapting to stress, working on their movements and learning the aggressive mindset of a Krav Maga fighter as fast as possible. This is how an Israeli Krav Maga class runs and this is how it is run in an Urban Tactics Krav Maga class. However, the best way for students to start should be: no-contact sparring, 10 % light touching, 30% contact with boxing gloves, 30% contact with bag gloves and helmet, 50% contact with bag gloves and helmet, and finally after a year of training students are allowed to do full contact sparring.